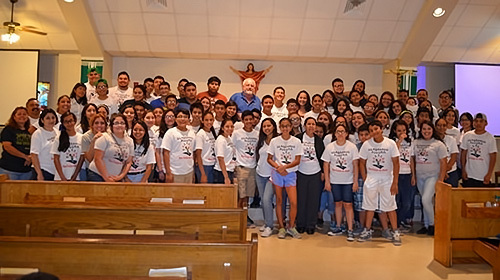 Pope Francis reached out recently to the children of Brownsville diocese, saying he wanted to be close to them. The Diocese of Brownsville lies on the Mexican border and is considered one of the most impoverished areas of the United States. “God calls you to receive mercy and show mercy to others. God calls you to be happy. Do not be afraid! Do not be afraid. Play life to the full! That is life,” Francis told them. Fr Tony O’Connor and some of the San Felipe de Jesus youth who celebrated the bi-centenary of the Marist pledge at Fourviere. The message was heard by parishioners of San Felipe de Jesus Church, a Marist parish in Brownsville. While packed on Sundays with youth and adults, Pope Francis’ message was particularly poignant for more than 100 migrant children under 18 years of age who attend Mass. New Zealand Marist Father, Tony O’Connor ministers to children coming across the border into the US. Most of these children are fleeing from poverty and violence… the journey is fraught with its own dangers…they have to grow up pretty fast. ” Most of these children are fleeing from poverty and violence”, he told the The Valley Catholic; a diocesan paper. The children, who are mostly from El Salvador, Honduras and Guatemala, enter the United States unaccompanied. 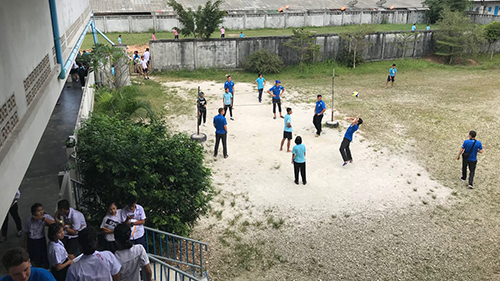 On arrival they are housed in shelters while arrangements are made to reunite them with relatives living the US or back in their country of origin. Tony O’Connor says they come to the United States in search of a better life, but the journey is “fraught with its own dangers”. Passing through moral and physical danger to get to the United States, “They often have had to grow up fast”, said Tony O’Connor who visits four different centros de refugio to hear confessions and visit the children. The San Felipe de Jesus Church welcomes the migrant children and has a section of the church reserved for them. “Everybody respects that space, says parishioner Miguel Lopes, who serves as an usher. “People will stand in the back of the church rather than sit there. “We are not afraid to admit we give them special treatment because we want them to feel special…. I see some of them crying as they pray. “We know they are going through a lot. “We feel their pain”, he said. Another parishioner, Yolanda Castillo agrees, saying the parish feels blessed to have them as part of the community. Asked if there was any reservations about having the children join them for Mass, parishoner David Gomez responded with certainty. “This is the house of God. “On the rare occasion the children don’t come to Mass we really miss them. We feel like a part of us is missing”, he said. Parishioner, Marcos Garcia is relatively new to the Marist parish. “He inspires us to serve and we pray for him constantly that he will continue to have the strength to minister to these children”. A campaign led by Australian Marist, Fr Jim Carty means asylum seekers in Sydney will be given travel concession cards enabling them to access services and support. New South Wales Premier, Mike Baird, announced the travel concession move last week. Fr Carty, who is Coordinator of the Marist Asylum Seeker and Refugee Services, applauds Premier Baird’s decision to grant the concession. Unable to work and receiving only A$412 a fortnight in benefit income, most asylum seekers in Sydney are living below the poverty line, he said. “NGO services offering asylum seekers assistance, particularly with health and medical care, trauma rehabilitation, language classes and other vital services, are spread out across the city. “But the cost of getting to each of these services and receiving the help they need made accessing these services extremely difficult and simply added to the stress of what are already traumatised people. “It is also important for asylum seekers, especially those with families, to be able to access food banks such as Oz Harvest,” Fr Carty said. However Fr Carty is playing down his role. “I was invited to be a part of the launching of the project and followed it up with accessing some pulpits to promote it. “Ray (Fr Ray Chapman), allowed me to use the homily time at all 11 masses one Sunday at St Pat’s in the city. “Given the current climate in Australia, the response was quite remarkable”, he said. Labelling the almost six-month campaign as “very much a collegial effort mostly carried out by young energetic committed people in the Sydney Alliance”, Fr Carty said the Alliance collect hundreds of thousands of used ticket stubs as well as receipts for travel on smart cards. Having collected the stubs and travel receipts they were sent to the NSW Premier, Mike Baird and Transport Minister, Gladys Berejiklian, who also received many thousands of email messages in support of asylum seekers being granted the cards. Fr Carty has worked with refugees and asylum seekers for more than 35 years. 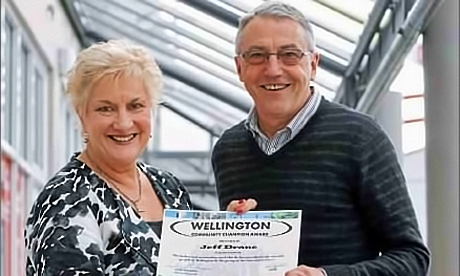 After more than 20 years working for community services Jeff Drane has been named a Wellington Community Champion. Fr Drane is perhaps best known for his work with the Newtown Budgeting and Advice Services. The work specialised in assisting under-resourced families, mental health consumers, refugees and migrants and delivered ongoing benefits to families. “It was just the relief of having enough money for rent so they could afford to go to the doctor”, he said. is a promoter and member of the living wage movement. Reflecting back, he said that emphasising the partnership with Māori and the importance of the Treaty of Waitangi met with a lot of resistance. But, he said, “it did a hell of a lot of good”. Presenting Jeff with his award, Rongotai MP Annette King said she was inspired by Jeff Drane’s compassion and ability to relate to people during his many years of assisting families. “It’s a hard job because you’re dealing with people in crisis,” she said. But for Jeff, it wasn’t like work at all. “If you love what you’re doing you never really have to work because it doesn’t feel like work”, he said. “I was of somewhat useful assistance to so many people. Jeff Drane is currently part of the Wellintown team. 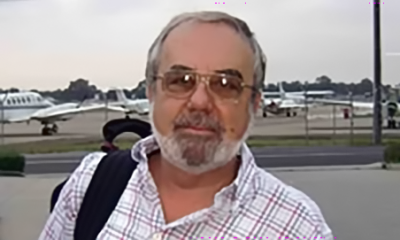 He focuses on facilitation that is creative, motivating and empowering and rather than seeking short-term solutions, he helps organisations chart their own authentic direction and discover new growth.